How disproportionately long does a phone have to be to lose its “mobile” title? Apparently conceptual phones of the future might push the form factors of phones to the limit. Or so is the case with Tamer Koseli’s Super Phone, which has an extra long design which both increases screen size and functionality (we never said it did so practically!) In fact, the Super Phone has enough room for two OLED displays on one continuous surface. When Koseli designed the Super Phone, he wanted a device which offered no frills. Just straight up productivity. But just because you won’t find an MP3 player or camera on this gadget, doesn’t make it a weakling. 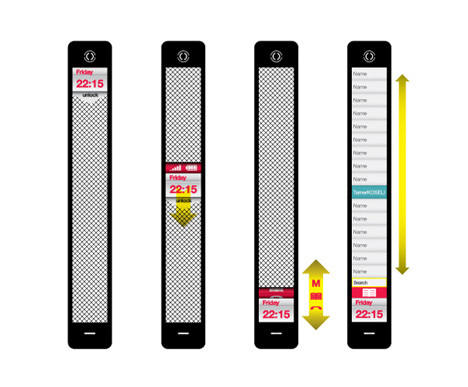 A small OLED on the device displays all of the basic information, such as time, date, and missed calls, while the extra large display on top is where all of the finger magic happens. 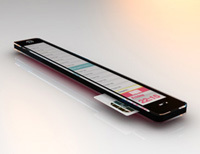 When you compare the size of the phone to the sim-card displayed, it’s really not as big as you would think. who would want to pay for something that you can’t even carry in your pocket, has to be sideways in your briefcase… and if this is targeting men, who generally already have a hard time using the touchable small button on an iPhone, why would a skinny screen be an easier alternative? No MP3 player, no camera… if I just want something to tell me the time I’ll use my watch. seems like you can’t even listen & speak during a phonecall without moving the phone up and down on your face, that’s ridiculous. idiotic there are cooler phones that that out here today…i just like the way phones look and that looks terrrrible.